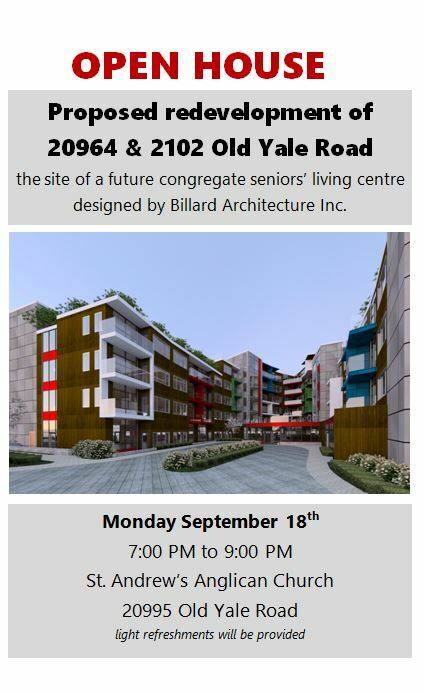 September 18, 2017 - Open House | Billard Architecture Inc.
We are pleased to be presenting the model and floor plans for the proposed redevelopment of 20964 and 2102 Old Yale Road in Langley, BC. Robert will be in attendance to answer questions, guide people through the design rationale and share a coffee and a cookie or two. There will be feedback forms for people to fill out. And if you can’t make it, keep watching this space. We will be loading that information here for your viewing pleasure as well.